So I was too lazy to cook. These are some of my favourite ‘food’ scenes from the movies-not necessarily films about food, but moments centred around food. 5. Breakfast at Tiffany’s opening scene, with coffee and pastry. The film has nothing to do with food, but I love Audrey. It’s strange because Audrey Hepburn was known to suffer from an eating disorder herself, and apparently this scene took several takes because she just couldn’t bring herself to take a bite of the pastry. This is an adorable movie and Remy has to be the most endearing rodent on film. 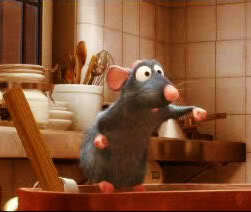 My favourite scene is the one where the harsh food critic eats Remy’s ratatouille and gets all emotional. Every scene from the movie is delicious! But I like the moments Vianne spends with her daughter as she breakfasts on hot chocolate and warm bread. This is perhaps my most enduring cinematic memory from childhood. 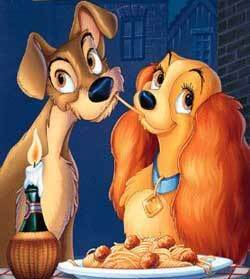 Lady And The Tramp is one of my favourite movies, and it’s one movie I have vowed never to delete from my laptop. If this doesn’t make you go awww, I don’t know what will. Know something?There is this very recent mal movie ‘Salt and Pepper’. The title song shows the normal, seedha saadha, casual, malayali food being eaten but ooh..I bet your mouth’ going to be watering by the end of that song (The picturiation is TOOOOO good!).. Also, they have a cake baking part.. you got to watch it! !